Shoreham are looking to get their season back on track as they enter the FA Vase on Saturday. Mussels’ winless run was extended to six matches as they were held to a 2-2 draw at newly promoted SCFL Premier Division Langney Wanderers last weekend. Shoreham boss Donnelly praised his players’ efforts in the draw and now wants them to build on that in the FA Vase second round qualifying encounter at league rivals Peacehaven & Telscombe. Mussels received a bye in the previous round, with Donnelly targeting a run in the competition. He said: “The FA Vase is like the FA Cup. It’s a massive competition. People talk about winning and losing, but there’s not a side in Sussex that have gone on to win it. It’s every manager’s dream, no cup match is a hindrance. “Football is in my blood, I look forward to every game that I manage. The Vase is just as important as a league match. We’re playing Storrington in a friendly tonight as we’ve got no midweek game. I’d rather have a match than a training session. It gives the players a chance to work together. Shoreham came from a goal down to lead but were eventually pegged back in their league clash at Langney on Saturday. Wayne Wilkinson’s effort was the difference at the break but goals from Stefan Joseph and Andrew Dalhouse – his eighth goal for Shoreham – saw them turn it around to lead after the restart. But Paul Rogers levelled ten minutes from time as it remained 2-2. 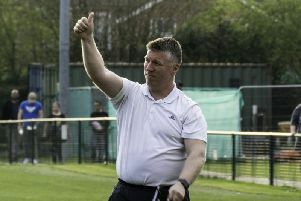 Shoreham were missing several players for the clash but Donnelly hailed his squad. An overwhelming nine players were missing for the match. Regular goalkeeper James Broadbent was out whilst Harvey Dunk and Josh Tuck are both still sidelined. Donnelly felt the whole team deserved credit for their performance and said he was looking positively at the result. “I think all my players should take an accolade, including my backroom staff,” Donnelly said. “We had nine players unavailable on Saturday. If we’d have won 7-2 that would have been an honest reflection. In all honesty it should have been three points. “You’re going to win some and you’re going to lose some. On Saturday I missed the spine of my side so I’d much rather dwell on how well we did without nine players. “I don’t look back at past results, I look forward. I would much rather say we came out of a losing sequence ahead of a very tough FA Vase fixture. Shoreham now face two cup clashes in the space of four days. An FA Vase clash at Peacehaven on Saturday is followed by a home Sussex RUR Cup meeting with rivals Lancing on Tuesday.